Background: Fractional CO2 laser is one of the most effective treatment options used to resurface scars. Objective: To evaluate the efficacy and safety of early treatment of postsurgical scar by fractional ablative CO2 laser. Methods: A total of 27 Egyptian patients with recent postoperative scars were enrolled in this study. Three sessions of fractional CO2 laser with a 1-month interval were started 4 weeks after surgery. Vancouver Scar Scale (VSS) was used as an assessment tool at 1 and 3 months after the final treatment. Patients reported their satisfaction using a subjective 4-point scale. Results: Results demonstrated a statistically significant overall average improvement of the VSS (5.33±1.33) before compared with (2.55±1.06) 3 months after the last laser treatment (P≤0.001). Among the individual parameters in the VSS, the most significant improvements were found in pigmentation, height, and pliability. Patient’s subjective satisfaction scores showed a significant greater degree of satisfaction after laser treatment. Conclusion: Fractional ablative CO2 laser is an effective and safe treatment modality for surgical scars in the early postsurgical period. Therefore, in this study, we aimed to evaluate the efficacy and safety of early treatment of postsurgical scar by fractional ablative carbon dioxide. A total of 27 Egyptian participants (15 females, 12 males; Fitzpatrick skin types III–V) aged 15–47 years, who had recent postsurgical scars (4–6 weeks after operation), were included in the study. Candidates with active infections, history of keloid, recent isotretinoin intake, smoking, and pregnancy were excluded. The study was initially approved by the ethical committee of Al-Azhar University. Written informed consent was obtained from all participants before enrollment. Parent or legal guardian of any patient under the age of 18 years signed the informed consent. For early intervention of the postoperative scar, three sessions of fractional CO2 10,600 nm laser (Smartxide square, Deka, Florence, Italy) with 1-month interval were started after 4–6 weeks of surgery. The treatment areas were cleansed by using a mild cleanser. A topical anesthetic cream (eutectic mixture of 2.5% lidocaine hydrochloride and 2.5% prilocaine; eutectic mixture of local anesthetics; AstraZeneca AB, Sodertalje, Sweden) was applied. After an hour of application, the anesthetic cream was gently removed to obtain a completely dry skin surface. Scarring sites were treated with fractional CO2 using a power of 10–15 W according to the skin type, dwell time of 500 µs, stack 2, and 700 µm spacing. The application of a sunscreen was continued. Topical antibiotic cream was applied twice per day for 3 days following the session. Patients were instructed to use a full-spectrum sunscreen regularly. Photographic documentation using identical camera settings, lighting, and patient positioning (CyberShot digital, DSCH50, Sony, Tokyo, Japan) were obtained at baseline, before each treatment session, and 3 months after the final treatment session. Vancouver Scar Scale (VSS) was used by two blinded dermatologists to assess the scars at baseline and 3 months after the final treatment. The VSS includes assessment of pigmentation, height, pliability, and vascularity of the scar. Each of the four parameters was assigned numbers according to the previously mentioned characteristics. Scores from all parameters were added together to attain a final VSS score. Patients reported their satisfaction with the treatment outcomes using a subjective 4-point scale. Patients were also questioned about the side effects of the treatment, especially bleeding, oozing, post-treatment dyschromia, crusting, and erythema at each session. SPSS software version 18 was used. In comparison to the different sessions for each participant, we estimated a P-value at most <0.05; consequently, we confirmed the significant difference of statistical analysis in this clinical trial. The present study was designed to evaluate safety and efficacy of early fractional CO2 laser treatment of postsurgical scar using VSS assessment. The age of the patients ranged from 15 to 47 years. Fifteen patients (44.44%) were females and 12 patients (45%) were males. Eleven patients (40.74%) had skin type III, 13 patients (48.14%) had skin type IV, and 3 patients had skin type V (11.11%). Three patients had postrhinoplasty scar, two patients had postblepharoplasty scar, eight patients had postsurgical scar due to trauma on the face, four patients had postabdominoplasty scar, three patients had post-thigh lift scar, three patients had postsurgical scar due to trauma on the arm, two patients had postsurgical scar on the neck, one patient had postsurgical scar on the back, and one patient had postcaesarian section scar. Meanwhile, the age of the scars ranged from 2 to 6 weeks with a mean of 4.3 weeks. The results demonstrated a statistically significant overall average improvement of the VSS (5.33±1.33) before compared with (2.55±1.06) 3 months after the last laser treatment (P≤0.001) (Figure 1). Among the individual parameters in the VSS, the most significant improvements were found in pigmentation, height, and pliability (Figures 2 and 3). 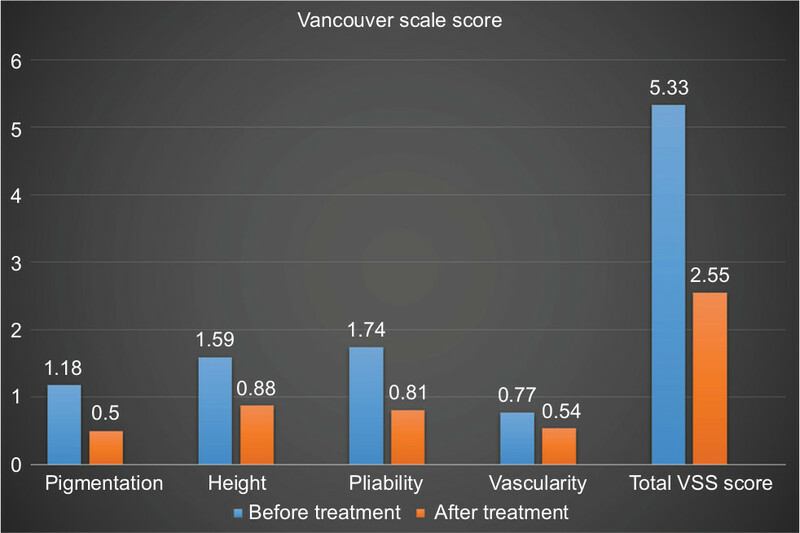 Figure 1 Vancouver Scale Score (VSS) (total and parameters) before and 3 months after laser treatment. 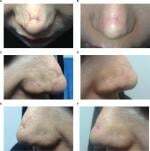 Figure 2 A 29-year-old female patient with recent postsurgical scar (rhinoplasty), before laser treatment (A, C, E) and 3 months after laser treatment (B, D, F). 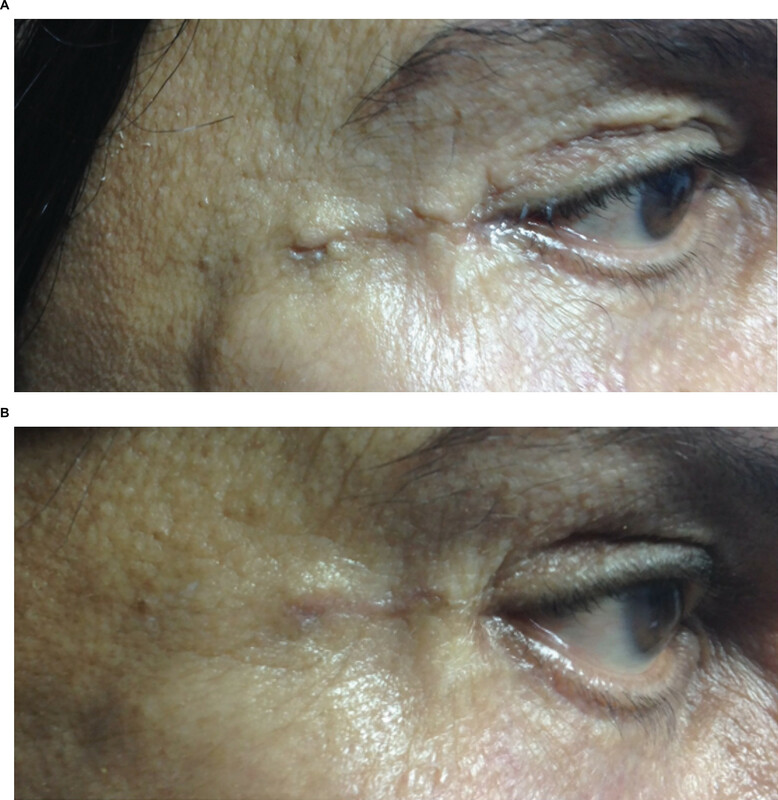 Figure 3 A 47-year-old female patient with recent postsurgical scar (blepharoplasty), before (A) and 3 months after laser treatment (B). Patient’s subjective satisfaction scores showed a greater degree of satisfaction after laser treatment, wherein six patients were very satisfied (22.2%), eight were satisfied (29.6%), seven were slightly satisfied (25.9%), and six were unsatisfied (22.2%) following three sessions of fractional CO2 laser (Figure 4). No side effects of the laser treatment were noted except one patient who showed postinflammatory hyperpigmentation. Figure 4 Patient’s satisfaction score before and 3 months after laser treatment. This current study aimed to evaluate the possibility of early intervention of fractional CO2 laser for improving the appearance of postsurgical scars. Assessment of the erythema, height, pliability, and pigmentation was done using the VSS, which was originally designed to assess subjective parameters in an objective way. Regarding total VSS, there was a significant improvement in VSS for postsurgical scars, 3 months after last session by fractional CO2 laser. The improvement was significant in all parameters of VSS score, with higher significance in terms of height, pigmentation, and pliability, while less significant in terms of vascularity. 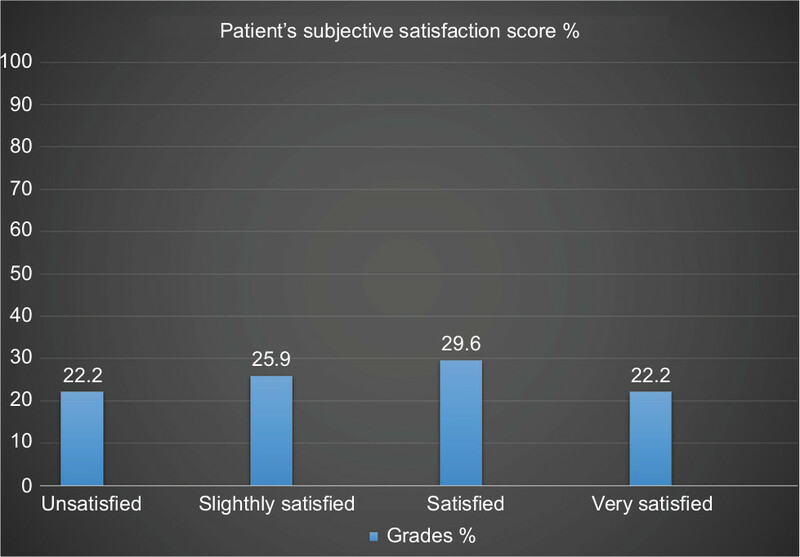 In the current study, there is a significant improvement regarding patients’ satisfaction grades. These previous studies coincide with our results which revealed that fractional CO2 laser could result in improvement in height and pliability. The improvement was highly marked in terms of scar height and pliability and less marked in terms of pigmentation and vascularity, but the overall VSS and each variable showed a significant improvement. Although the mechanism of fractional photothermolysis in the treatment of atrophic and hypertrophic scar is not known exactly, the columns of thermal injury characterized by localized epidermal necrosis and collagen denaturation may initiate a cascade of events that eventually results in a normalization of the collagenesis–collagenolysis cycle.22 Regarding the early fractional CO2 laser intervention, it can, in theory, normalize collagen and realigns abnormal collagen fiber by thermal effect of laser treatment. There were some limitations in our study, such as being single center in nature, and with variability in initial morphology and, anatomical sites of the scars. Controlled side-to-side comparative studies with larger sample size and longer follow-up period are required. In addition primary outcome measure, although validated, is largely subjective. Fractional ablative CO2 laser is an effective and safe treatment modality for surgical scars in the early postsurgical period. Overall improvement was statistically significant in the VSS. Elsaie ML, Choudhary S, Mcleod M, Nouri K. Scars. Curr Probl Dermatol. 2011;42:131. Bian D, Zhang J, Wu X, et al. Asiatic acid isolated from Centella asiatica inhibits TGF-β1-induced collagen expression in human keloid fibroblasts via PPAR-γ activation. Int J Biol Sci. 2013;9(10):1032–1042. Ibrahim SM, Elsaie ML, Kamel MI, Mohammed EE. 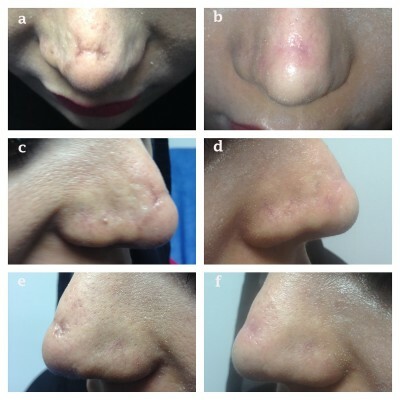 Successful treatment of traumatic scars with combined nonablative fractional laser and pinpoint technique of standard CO2 laser. Dermatol Ther. 2016;29(1):52–57. Lupton JR, Alster TS. Laser scar revision. Dermatol Clin. 2002;20(1):55–65. Eilers RE, Ross EV, Cohen JL, Ortiz AE. A combination approach to surgical scars. Dermatol Surg. 2016;42(Suppl 2):S150–S156. Elsaie ML, Choudhary S. Lasers for scars: a review and evidence-based appraisal. J Drugs Dermatol. 2010;9(11):1355–1362. Manuskiatti W, Wanitphakdeedecha R, Fitzpatrick RE. Effect of pulse width of a 595-nm flashlamp-pumped pulsed dye laser on the treatment response of keloidal and hypertrophic sternotomy scars. Dermatol Surg. 2007;33(2):152–161. Choe JH, Park YL, Kim BJ, et al. Prevention of thyroidectomy scar using a new 1,550-nm fractional erbium-glass laser. Dermatol Surg. 2009;35(8):1199–1205. Conologue TD, Norwood C. Treatment of surgical scars with the cryogen-cooled 595 nm pulsed dye laser starting on the day of suture removal. Dermatol Surg. 2006;32(1):13–20. Yun JS, Choi YJ, Kim WS, Lee GY. Prevention of thyroidectomy scars in Asian adults using a 532-nm potassium titanyl phosphate laser. Dermatol Surg. 2011;37(12):1747–1753. Jung JY, Jeong JJ, Roh HJ, et al. Early postoperative treatment of thyroidectomy scars using a fractional carbon dioxide laser. Dermatol Surg. 2011;37(2):217–223. Oliaei S1, Nelson JS, Fitzpatrick R, Wong BJ. Laser treatment of scars. Facial Plast Surg. 2012;28(5):518–524. Nouri K, Jimenez GP, Harrison-Balestra C, Elgart GW. 585-nm pulsed dye laser in the treatment of surgical scars starting on the suture removal day. Dermatol Surg. 2003;29(1):65–73. Tierney E, Mahmoud BH, Srivastava D, Ozog D, Kouba DJ. Treatment of surgical scars with nonablative fractional laser versus pulsed dye laser: a randomized controlled trial. Dermatol Surg. 2009;35(8):1172–1180. Kim HS, Kim BJ, Lee JY, Kim HO, Park YM. Effect of the 595-nm pulsed dye laser and ablative 2940-nm Er:YAG fractional laser on fresh surgical scars: an uncontrolled pilot study. J Cosmet Laser Ther. 2011;13(4):176–179. Orringer JS, Rittié L, Baker D, Voorhees JJ, Fisher G. Molecular mechanisms of nonablative fractionated laser resurfacing. Br J Dermatol. 2010;163(4):757–768. Manstein D, Herron GS, Sink RK, Tanner H, Anderson RR. Fractional photothermolysis: a new concept for cutaneous remodeling using microscopic patterns of thermal injury. Lasers Surg Med. 2004;34(5):426–438. Kim HS, Lee JH, Park YM, Lee JY. Comparison of the effectiveness of nonablative fractional laser versus ablative fractional laser in thyroidectomy scar prevention: A pilot study. J Cosmet Laser Ther. 2012;14(2):89–93. Lee SH, Zheng Z, Roh MR. Early postoperative treatment of surgical scars using a fractional carbon dioxide laser: a split-scar, evaluator-blinded study. Dermatol Surg. 2013;39(8):1190–1196. Alster TS, Zaulyanov L. Laser scar revision: a review. Dermatol Surg 2007;33:131–140.